Once more, Daredevil opens with Fisk’s perspective. This time, it’s a room check courtesy of Agent Pointdexter while Fisk cooperates with all demands. The antagonist relationship between these characters slowly gives way to a partnership of necessity throughout “Blindsided,” and it’s a storyline as well-seeded as it is uncomfortable to witness. Unfortunately, Foggy can’t buy his girlfriend coffee as a thank you because Matt has stolen his wallet. He uses it to pay a cab while he heads into prison as his best friend in order to meet with an old client. Turns out the partners got 16 years knocked off his sentence, which buys him a decent-sized favor in the form of an introduction to the Albanians’ Vic Jusufi. If only that introduction didn’t come at such a grotesque cost – but more on that, which makes up the bloody heart of “Blindsided,” later. Ray gets a visit from his adoring wife, only to learn that his son is going through intense stress over the events of the previous week. He promises nothing will happen to him, but that’s not enough to convince her. It’s a heartbreaking scene that does more to develop his character than any of the ones in the previous episode. He even gets some necessary advice from his boss about how to deal with his son’s fears, further humanizing in the wake of a war that’s about to get very bloody. The only problem here is that it’s still not clear what role Ray is set to play, unless he’s simply meant to be the opposite of fellow FBI Agent Pointdexter. Karen continues her research in Fisk and the FBI asset freeze he may be skirting, but Foggy interrupts her work to inform her about Matt’s reappearance. Her ability to recognize that Matt is still alive based solely on Foggy’s expressions speaks to both their friendship and her connection with him, much more so than the previous two seasons’ worth of ship-baiting has. Her righteous indignation also feels earned, given what he’s put her through, and nothing feels sweeter than her pulling away from the man who won’t leave room for either of them. Matt (still pretending to be Foggy) has to get a check-up from the prison doctor after his ex-client makes a show of punching him in the face, and the visit quickly turns into another assault without warning. Next thing he knows, he’s receiving a phone call from Fisk reminding him of the threat he once made regarding Vanessa. Thanks to some old bravado, Matt is left fighting his way out of jail in the season’s most intense sequence yet. Things don’t get any better for him when the cops come, as they start beating him themselves instead of providing assistance. The messy and terrifying scene is well-directed, with properly placed chaos that doesn’t lose sight of the important story elements, and eventually leads to the meeting with Vic that Matt wanted so badly. By ratting them out to the FBI, Fisk has left himself vulnerable to betrayal in turn. Matt presses his advantage despite the difficult circumstances, and his desperate determination speaks to how little will he has left to live. The kinship he finds with the Albanians in those brief moments before he’s dragged out by corrupt cops is as compelling as it is terrifying. Foggy’s time with the police officers probably goes a little better than Matt’s, despite a few hiccups based on his defense lawyer history. When it comes to putting Wilson Fisk back behind bars, the police officers’ union is willing to side with whoever it takes, and Foggy’s pride at convincing them to back him for District Attorney is palpable. At the same time, Karen is proving rather menacing in her search for answers. She threatens some boys on the street and then practically barges into the home of a Red Lion Bank contact. She may have obtained the name she so clearly needed, but in the process she’s proving that her mental state isn’t that much clearer than Matt’s. Speaking of unhealthy mental states, Pointdexter’s unsettling behavior levels up when he sends another agent out for a cup of coffee just so he can go through old Fisk footage with a wild look in his eyes. Fisk covered for him, which is a relief for now but most likely means Pointdexter will be in his debt from now on – especially when Fisk looks directly into the camera as if to say, “got you.” In response, the agent turns off the cameras in Fisk’s room and demands to know his game. He may be angry now, but there’s no doubt he’ll be in Fisk’s pocket sooner rather than later. “Blindsided” ends true to its title, with a bloody Matt waking up in a car that drives him off a bridge without explanation. 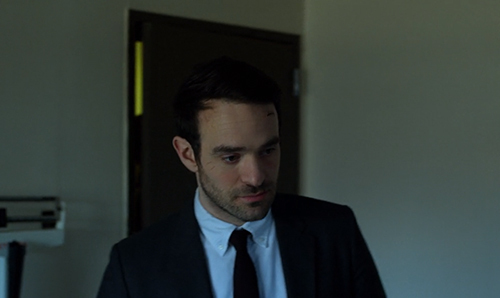 It’s a disorienting final scene that still provides a better look at the story’s direction than the first three episodes of this Daredevil season did. Daredevil Season 3 is streaming now on Netflix.